The Bakerville-Loveland Trail is a paved trail linking the Clear Creek County town with the Loveand Ski Area near the Continental Divide. Its trailhead in Bakerville can be reached by taking Interstate 70 to the Bakerville exit 221. Turn left, cross the bridge over the interstate and turn right to reach the parking area. The forested trail parallels Interstate 70, but it not visible and Clear Creek drowns out most all traffic noise. It is also a section of the Continental Divide National Scenic Trail. The five-mile trail is a excellent for snowshoe and cross-country ski beginners as it’s closed to snowmobiles or any other motorized vehicle and has a gentle grade. It also makes an easy hike or bike ride in warmer months. The trail can serve as a nice distraction for someone looking for an easy, free, snowshoe hike or Nordic ski while waiting on family or friends at Loveland Ski Area as well. After four-miles, there’s an option to turn right off the main trail and onto a narrow, marked cross-country ski trail through the trees. It offers some sharp turns and steep hills not found on the main trail and re-connects near Loveland. For those who are looking for more, this National Forest trail can be used to access Herman Gulch Trail and Watrous Gulch Trail via an underpass. 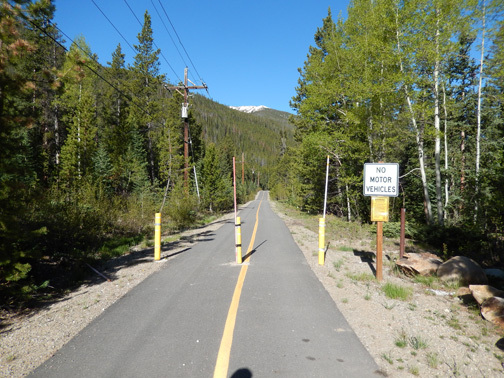 Completed as a partnership between the Colorado Department of Transportation, Clear Creek County, the U.S. Forest Service and members of the bicycling community, the bike path was another step forward in realizing the 1990 Intercounty Nonmotorized Corridor Master Plan. Only one segment remains between Denver and Glenwood Springs where bicyclists need to use the I-70 shoulder—a two-mile section between the Genesee Interchange and Evergreen Parkway. Be cautious when recreating outdoors in winter conditions. The season has short days, strong winds, low temperatures and rapidly changing weather. Be prepared by carrying extra clothing for layering, as well as water and high-energy food. Prevent frostbite by keeping your extremities and face protected. Also, avoid hiking in deep snow, which can be quickly fatiguing and creates hazardous holes for skiers and snowshoers who follow. Visit http://www.fs.usda.gov/main/arp/home to learn more. Trail Features: Paved section of the Continental Divide National Scenic Trail running along Clear Creek connecting Bakerville and Loveland Ski Area. Perfect for beginning snowshoeing, cross-country skiing or a hike or bike ride before the snow falls. Trail Location: Trail is accessed from I-70 Bakerville exit 221. At exit, turn south. Immediately ahead is plenty of parking at the trailhead by the old chimney. Tags: Bakerville-Loveland Trail, Clear Creek County, Loveland Ski Area. Bookmark the permalink.